Microgaming has teamed up with Home Box Office (HBO), the creators of the hit television series Game of Thrones – itself based on the #1 best-selling book series, A Song of Ice and Fire – to bring another high-quality and graphically advanced real money video slot to its associated online casinos. This partnership can easily boast to be the biggest and most popular license any casino game developer has ever managed to secure, with millions of Thronies worldwide. The Game of Thrones pokies are a set of a five-reel slots – one a fixed 15 payline video slot and the other a 243 ways fixed video pokie. The scatters, wilds and other symbols are all comprised of famous iconography from the television series – namely, the banners of each noble house, such as the Starks of Winterfell, the Baratheons of Storm’s End, the Lannisters of Casterly Rock, the Targaryens of Dragonstone, and the imposing Iron Throne itself. All aspects of the slot are complemented by immersive graphics and stellar sounds from the epic television series to truly capture the authentic stylistic properties that make the universe of George R.R. Martin so popular with mass audiences. 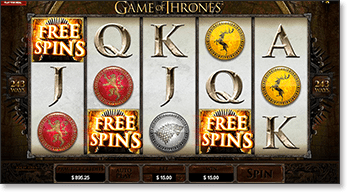 Catering to both new and experienced pokies players, the Game of Thrones slots are available in free practice play and real money modes, available through Web browsers in instant Flash play or through dedicated downloadable Microgaming casino hub clients. 15 Paylines – Wager up to 10 coins per spin on 15 fixed bet lines. This version comes with four coin sizes – 0.01, 0.02, 0.05, and 0.10 – in real cash play, and a maximum cash jackpot of $750,000. 243 Ways to Win – Stake up to 10 coins per spin and cover 243 possible hits at once. There are three coin options – 0.01, 0.02, and 0.05 – in real money mode, and up to $605,000 to be won. Play Game of Thrones Slots and other high-quality real money online pokies from renowned and trusted casino game developer Microgaming at www.RoyalVegasCasino.com. The Game of Thrones video pokie includes an interactive free spins round where players can rake in thousands of dollars without risking a cent. The feature is triggered by getting three or more Iron Throne scatter symbols anywhere on the reels. The game will then load up a Free Spin Selection screen, where you can choose from four specific bonus features – each representing one of the major noble families of the television show and novels – which award multipliers and stacked symbols with the animal sigil of the houses. House Baratheon – 8 free spins with a 5x fixed multiplier, and the Stag sigil symbol appears in stacks of three. House Lannister – 10 free spins with a 4x fixed multiplier, and the Lion sigil symbol appears in stacks of four. House Stark – 14 free spins and a 3x fixed multiplier, and the Direwolf sigil symbol appears in stacks of five. House Targaryen – 18 free spins and a 2x fixed multiplier, and the Dragon sigil symbol appears in stacks of six. The free spins rounds can produce the biggest wins in Game of Thrones real money pokies, with up to a 6,050,000 coin jackpot on offer in the 243-ways version and up to 750,000 coins when playing 15 paylines. The Gamble Trail feature takes players through four locales across the sprawling map of Westeros and beyond the Narrow Sea. This is much like the gamble feature found on so many classic video pokies, using a heads or tails flip of a Braavosi silver coin engraved with the famous (or infamous) Valyrian words, Valar Morghulis. You can play this feature after any successful spin, and even directly after the free spins bonus game. 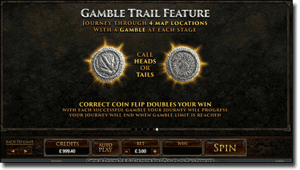 Simply hit the ‘Gamble’ button in the bottom right of the screen, and you will be taken to a trail map with four stages. Starting at Three Eyed Raven, you can choose either heads or tails on a standard 50/50 coin flip. If you get it right, you double your bet and move on to the White Walker level; if you guess wrong, the feature ends you lose all your winnings. The feature is complete once you either pass all four levels or reach the gamble limit. Just like the old-school gamble option on Aussie slots, you can take the money and run at any point in proceedings. For example: if you win three flips to pass the Direwolf level but you don’t fancy trying a fourth at the final Dragon stage, you can simply click ‘Collect’ to pocket your winnings (at 8x the original amount) and head back to the main game. 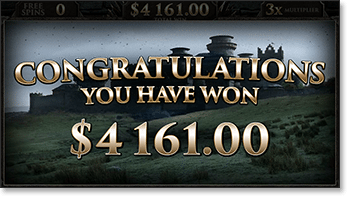 Game of Thrones pokies are available at Microgaming-partnered online casinos only. This includes several of our top recommended slots sites, namely www.RoyalVegasCasino.com, www.Casino-Mate.com, and www.7SultansCasino.com. All of our casino sites are recommended for their high-quality games catalogues, customer service, easy-to-navigate casino interfaces and certified approval from gambling industry watchdogs like eCOGRA (eCommerce Online Gaming Regulation and Assurance), which only awards its Seal of Approval to sites which pass its biannual tests of gambling fairness and security.